Part One: General issues "sets issues of constitutional law firmly in context including topics such as the making of constitutions, the impact of religion and culture on constitutions, and the relationship between international law and domestic constitutions. Part Four: New Challenges - explores issues of importance such as migration and refugees, sovereignty under pressure from globalization, Supranational Organizations and their role in creating post-conflict constitutions, and new technological challenges. 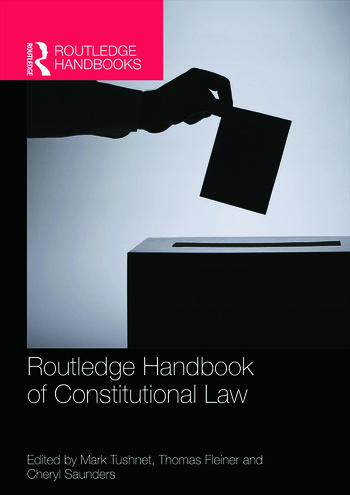 Providing up-to-date and authoritative articles covering all the key aspects of constitutional law, this reference work is essential reading for advanced students, scholars and practitioners in the field. Thomas Fleiner is Professor Emeritus. University of Fribourg, Switzerland and was former director of the Institute of Federalism. Professor Fleiner has served as a legal expert for Swiss and foreign governments and has been a guest professor in eight countries. Cheryl Saunders is Laureate Professor, Melbourne Law School. President Emeritus, International Association of Constitutional Law. Professor Saunders also served as former president of the International Association of Centers for Federal Studies. She is also the author of The Constitution of Australia: A Contextual Analysis (Hart Publishing Ltd, 2011) and various books, chapters and articles on comparative constitutional law and method.